Who wouldn’t love to live in a perfect world living the ideal perfect life? Wouldn’t everyone love the power to shape their own lives, their own worlds, into the life they long to have? 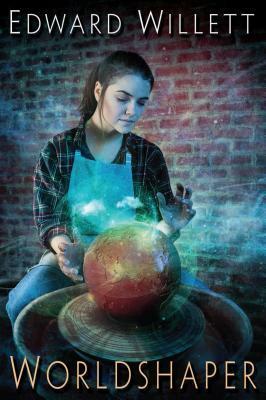 Author Edward Willett has brought this very power to life in Worldshaper, the first in his new portal fantasy series, and it most certainly kicks off his series with a rather intriguing start. With a pottery studio to call her own, an incredible boyfriend, and nothing but fond memories of the life she has lived, Shawna Keys is living her ideal life. Yet all that was perfect is taken in an instant when a lunch date with her best friend turns into a nightmare. Mysterious attackers kill her best friend and just as they are about to kill Shawna, time resets itself, placing Shawna three hours in the past. No one remembers the attack for it never happened and no one remembers Shawna’s friend… for she never existed. Fearing for her sanity, Shawna is approached by a stranger who tells her she has the power to Shape worlds and the reason her world had been so perfect was because she Shaped it to be. But now, her world is in danger for a threat known as the Adversary has been traveling from Shaped world to Shaped world and taking control of them. While she is too late to save her world, Shawna learns she carries within her the power to save other worlds and thus sets out on a journey of uncertainty to help other Shapers when she herself does not remember how she ever became one. Willett has many fantastical works under his belt, but for those who are first being introduced to his writing, Worldshaper is a great book to start with. The best way to describe Willett’s writing style is fun. Of course, all authors have fun when it comes to writing, but there are those authors that are far and few between who readers can tell are having fun playing with words and creating sentences. Take these two sentences for instance. “The earlier part of the hike had been tremendously tiring. Now it also became scarily slippery, cursedly cold, and wearingly wet – just all-around alliteratively annoying” (Willett 133) and “If there’s one thing you don’t want to hear from the semimystical guide who is attempting to spirit you from one world to another without attracting the attention of a godlike murderous Adversary, it’s, ‘Uh-oh’” (Willett 144). These are but two of many fun and cleverly written lines scattered throughout his book. The story itself matches Willett’s writing style as Worldshaper has many fun and adventurous moments. Perhaps the only setback is the fact it takes a little while to reach those moments. The set up for the story in general is incredibly well thought out and planned, but at the same time, it has a tendency to drag at times and it begins in a rather cliché way. A character’s perfect life is disrupted so a mysterious stranger appears to let the main character know she has incredible power and is more powerful than most like her, but the problem is she has no memory of how she acquired power. Sound familiar? However, this in no way makes Worldshaper a bad story and this is actually where the clichés end. Leading up to the adventurous moments of the story are what could be considered “filler” moments as Willett introduces the readers to his world. At times, yes, these moments can become a bit confusing and even, at times, a bit repetitive, but once readers reach the halfway mark of Worldshaper, this is where the fun begins. Readers get to travel with Shawna and her guide across the country by means of travel that may remind some readers of Planes, Trains, and Automobiles. Being told in the first person, readers will fall in love with Shawna’s wit and charm and will love the many pop culture references she uses as she travels with her guide who humorously misunderstands nearly everything she says. The most exciting part of the story is once readers come close to the ending of the story. Without spoiling anything, the story takes a COMPLETELY unique turn that no reader sees coming and captures the attention of the reader to the point where they will not stop reading it until they reach the final page. The best words to describe the ending are as follows: bizarre, unique, intriguing, and entertaining. In other words, any reader who is a fan of fantasy and science fiction will adore the turn this story takes. If one could shape their perfect world, what would it be like? Willett has made this idea come to life in Worldshaper, the first in his new fantasy series that has amazing potential. It is most certainly a story to be experienced by readers and they will most certainly have fun once they read it. It is a bit slow and cliché to start, but come the halfway point, readers are in for a real treat. Willet’s writing style is superb, witty, and paints a beautiful picture, being one of very few authors today where readers can tell he is just having fun playing with sentences and words. Who knows how many books this series will contain and there are plenty of opportunities to delve deeper into Willet’s fantasy world and learn more about it, but one thing is for certain: upon completing Worldshaper, readers will definitely want to know what happens next.